Buy products for this condition! An ankle sprain is an acute injury that results in stretching, partial rupture or complete rupture of the ligaments of the ankle. The most common ankle sprain is an injury to the lateral ankle ligaments. Lateral ankle sprains are an acute event that may lead to chronic lateral ankle instability. 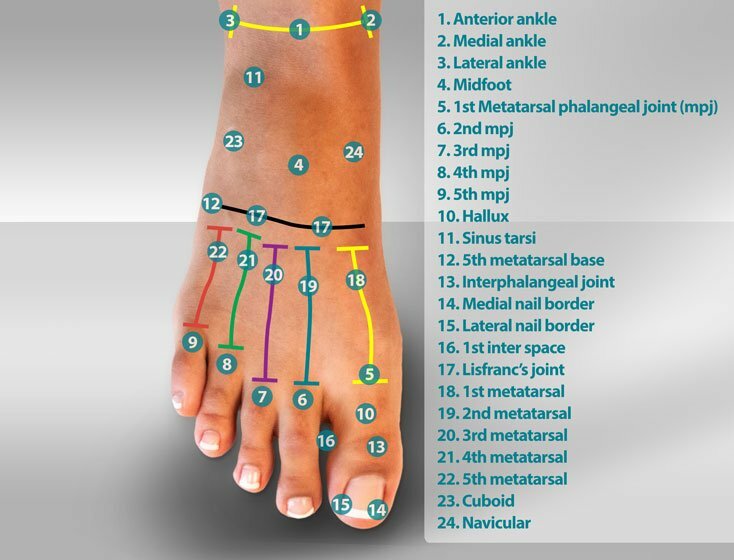 Medial and high ankle sprains occur but are found with far less frequency. Treatment of ankle sprains may include immobilization of the ankle, physical therapy, and surgery. Immediate onset of pain at the time of injury. Within 60 minutes the ankle will swell, become stiff, and be painful with weight bearing. Primary location of the pain in lateral ankle sprains will be in the anterior lateral aspect of the ankle. Extent of swelling and bruising will vary based on the severity of the sprain. Pain may persist for several weeks. Ability to bear weight varies with the severity of the ankle sprain. The lateral ankle is supported by three ligaments called the lateral collateral ligaments . These ligaments include the anterior talo-fibular ligament (ATF), calcaneal-fibular ligament (CF), and the posterior talo-fibular ligament (PTF.) Isolated ATF sprains make up more than 75 percent of all ankle sprains. The ATF is a relatively small ligament running from the anterior aspect of the fibular forward to attach to the neck of the talus. The calcaneal fibular ligament (CF) is the second-most commonly injured ligament of the lateral ankle. The CF is rarely injured as an isolated injury. The CF is usually injured in conjunction with the ATF. The CF runs from the fibula to the heel bone (calcaneus.) 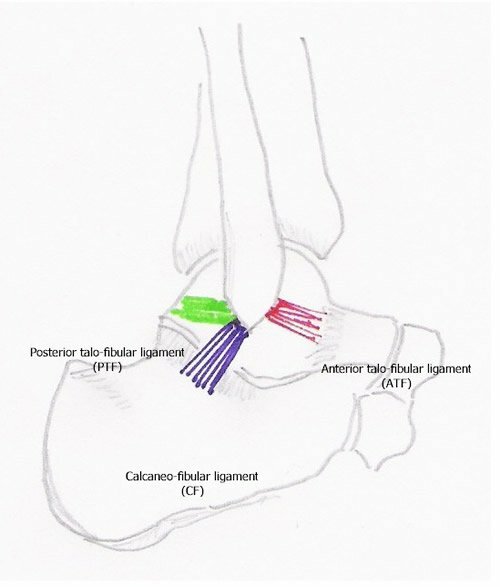 The posterior talo-fibular ligament extends from the fibula posteriorly to the posterior process of the talus. The PTF is rarely injured in a lateral ankle sprain. Lateral ankle sprains are graded by the location of the injury and amount of damage to each ligament. Lateral ankle sprains are graded as grade I, II or III ankle sprains. A grade I sprain is an injury that results in a stretch of the ATF ligament. Grade II is a partial rupture of the ATF and stretch injury of the CF ligament. Grade III is a complete rupture of both the ATF and CF ligaments. 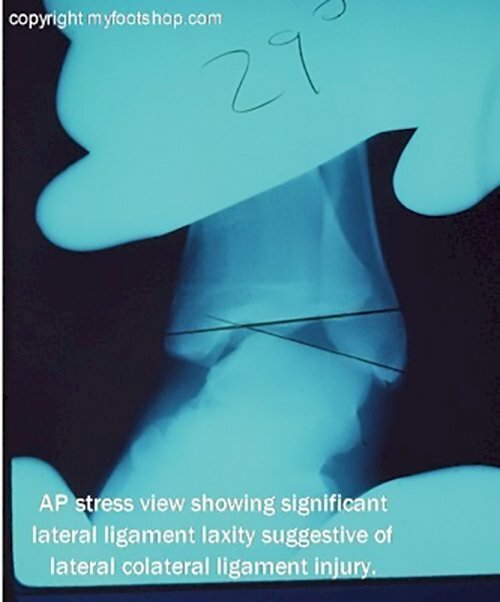 All ankle sprains result in an injury of the ATF ligament. Only a grade III affects the PTF, and even with a grade III the injury sustained by the PTF ligament is minimal. Medial ankle sprains do occur but are far less common than lateral ankle sprains. The medial ankle is supported by a heavy ligament called the deltoid ligament. The deltoid ligament actually consists of five interwoven ligaments that create a broad fan of ligamentous tissue supporting the medial ankle. When an injury does occur to the medial ankle, stress applied to the deltoid ligament is often transferred to the distal tibia, resulting in a fracture of the medial ankle. The term high ankle sprain describes an injury to the anterior inferior tibial-fibular ligament (in pink in the image to the left.) The anterior distal tibial-fibular ligament is also known as the Tillaux-Chaput ligament. The anterior inferior tibial-fibular ligament is the most distal ligament of the lower leg and maintains the contact of the fibula and tibia. Disruption of the anterior inferior tibial-fibular ligament results in widening (diastasis) of the distal tibial-fibular articulation. Diastasis of the distal tibial-fibular articulation results in ankle instability and progressive arthritis of the ankle if left untreated. 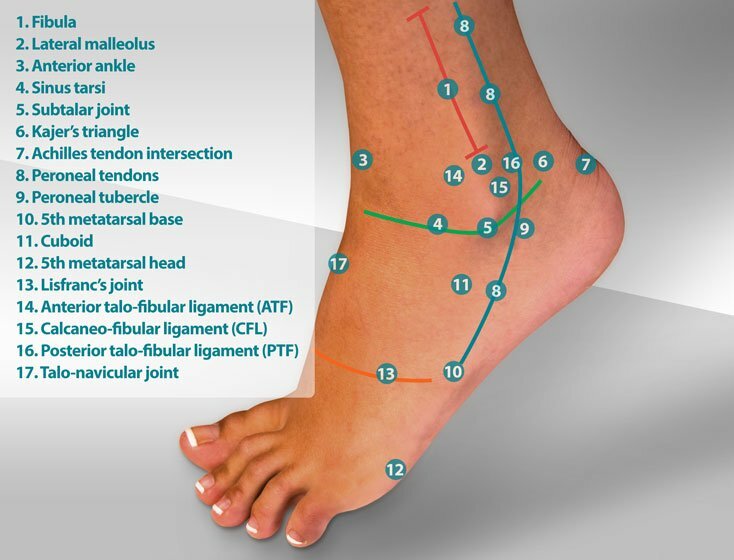 Ankle sprains occur as a result of the inherent biomechanics of the foot and how those biomechanics interact with the supporting surface or ground. The foot acts as a stable platform for the leg as it carries body weight. When the center of gravity for body weight deviates laterally, eccentric load is applied to the ankle, resulting in instability and possible lateral ankle sprain. The biomechanical properties of the foot can often contribute to chronic lateral ankle instability. In the case of a lateral ankle sprain and particularly in cases of recurrent sprains, the biomechanical relationship seen in the foot is called rearfoot varus and forefoot valgus. 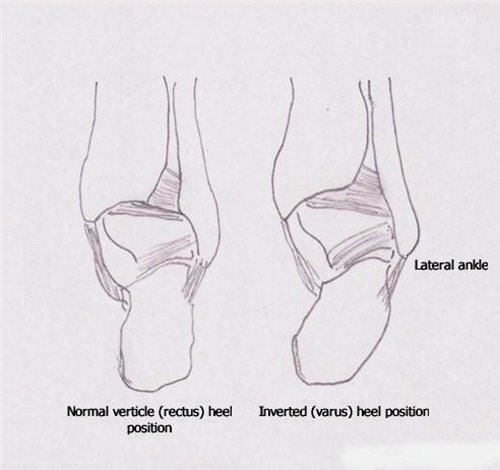 Rearfoot varus refers to an inverted position of the heel upon heel strike. Rearfoot varus can be a fixed position (uncompensated), partially flexible (partially compensated) or flexible (fully compensated.) An uncompensated rearfoot varus deformity is a significant contributing factor to acute and chronic ankle sprains. The image at left shows uncompensated rearfoot varus. Forefoot valgus is a term that refers to the position of the bones in the forefoot in relationship to the heel. Once again, the terms uncompensated, partially compensated, and fully compensated are used to describe this structural position. Forefoot valgus is a position where the medial side of the forefoot is lower than the lateral side of the forefoot. During the midstance phase of gait, as the body passes over the foot, forefoot valgus rolls the foot to the lateral side, throwing the center of gravity to a position that invites an ankle sprain. The picture on the right of this page shows the relationship of severe forefoot valgus and rearfoot varus. The position of the finger represents level ground. With each step, the foot has to roll to the outside to become level with the ground. Each time it does so, it throws the center of gravity out over the lateral aspect of the ankle, making one much more prone to sprain. 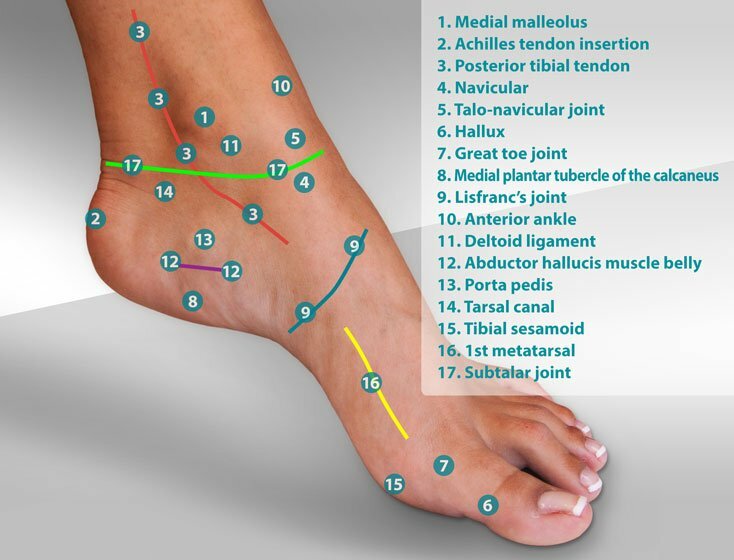 The combination of forefoot valgus and rearfoot varus can be a significant contributing factor to acute ankle sprains, repetitive ankle sprains, and recurrent ankle instability. After an ankle sprain, think RICE. Rest is essential after an ankle sprain and can be achieved in many different ways. Rest can be as simple as backing off from normal activities, or it can be a hard cast and crutches or walker. What's best for you? After a sprain, give the ankle several days before getting back to any activity. Only bear weight to tolerance. If the ankle hurts, back off and do less. Some weight-bearing is good because it helps break up scar tissue and encourages range of motion. Too much weight-bearing leads to unnecessary swelling. Ice controls swelling. Personally, I'm not a big fan of heat at any time during the healing of an ankle sprain. The more ice the better. Care should be taken not to injure the skin, particularly if a patient has a loss of sensation through a condition such as diabetic neuropathy. 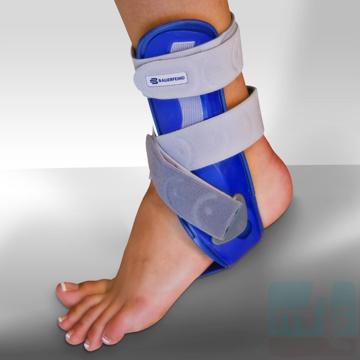 Compression also controls swelling and is used to splint the lateral collateral ligaments in a corrected position. 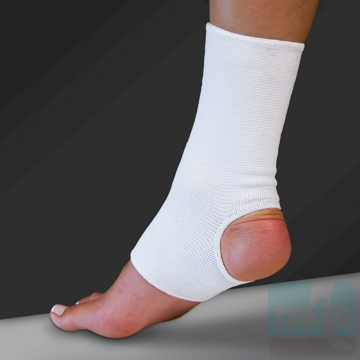 Compression can be accomplished through a variety of different aids such as ace wraps or ankle supports. And finally, elevation. Elevation is one more method that can control swelling. Patients with ankle sprains usually recognize the advantages of elevation even weeks after the injury. There are many ways to prevent a second or recurrent ankle sprain. Much of preventative care depends on the patient and the patient's activities. As an example, a patient is involved in a unidirectional sport such as running. An ankle brace would be cumbersome and probably detract from the enjoyment of a run. For this patient, we would use a lateral sole wedge to inhibit supination of the foot. A lateral sole wedge is designed to realign the center of gravity and place it back squarely over the foot. A lateral sole wedge would be a great tool for the chronic ankle-sprainer who is a runner, or for street shoes. It's important to recognize that a lateral sole wedge, in this case, is not a simple arch support. Increasing the arch height would tend to move the center of gravity to a position where the ankle would be more prone to sprain. 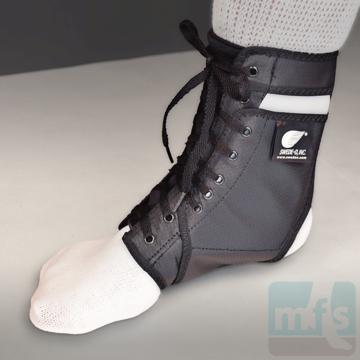 For those athletes who participate in bi-directional sports such as racquetball or tennis, an ankle brace is indicated. The forces applied to the lateral ankle in bi-directional sports are just too great to be controlled by a lateral sole wedge or arch support. Stirrup braces are helpful in the acute phase of sprains to control edema but aren't all that helpful in bi-directional sports for controlling torsion of the leg or inversion of the foot. Lace-up ankle braces, particularly those that will lace into the shoe, are very effective in preventing recurrent lateral ankle sprains. New braces are available that are thinner and easier to use than a traditional lace-up ankle brace. Supination is another biomechanical contributing factor to ankle sprains. Supination is the tendency to roll to the outside of the foot. Supination can be controlled by placing a lateral sole wedge on the outside of the shoe or by using a lateral sole wedge insert. Heel wedges may also be used to control supination. Several physical therapy techniques are helpful during rehab after ankle sprains. Physical therapists will use proprioception exercises to re-educate the ligaments of the ankle. Proprioception is the sense of knowing where you are in space. The lateral collateral ligaments benefit from this re-education process. The concept is to try to make the ligaments more responsive to the next possible injury. For instance, when able stand in a doorway, place all of your body-weight on the injured ankle. Balance by holding on to the door. As you start to gain more balance, close your eyes. This physical therapy technique isolates the ankle and forces it to be re-educated. 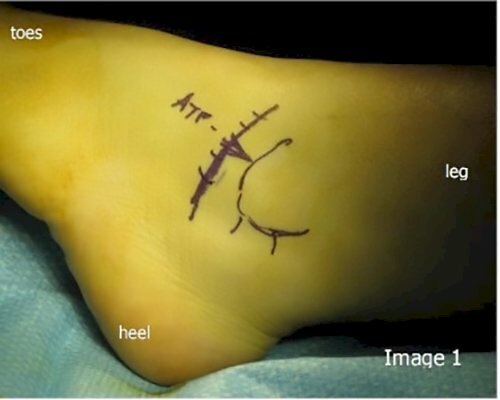 If a patient has recurrent sprains, surgical stabilization of the ankle is indicated. An unstable ankle will progressively lead to ankle arthritis. Ankle stabilization is a surgical procedure that involves repair of the lateral collateral ligaments. The status of the lateral ligaments of the ankle can be assessed with X-rays using stress applied to the ankle, or with an MRI. The most common procedure performed to stabilize the lateral ankle is called a Brostrom procedure. 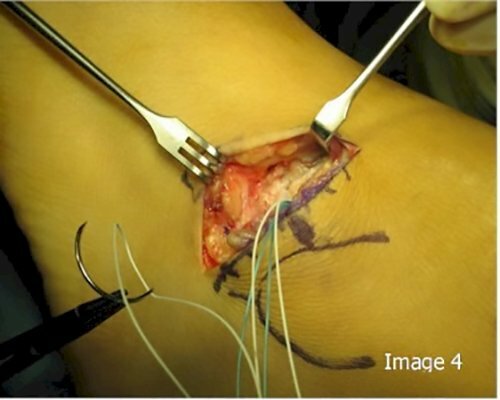 A Brostrom procedure recreates the ATF ligament through bone anchors and adjacent soft tissue at the lateral ankle. Occasionally, in severe cases, a tendon transfer may be indicated to assist in stabilizing the lateral ankle. Tendon transfer procedures can be quite extensive and all require prolonged periods of immobilization. Tendon transfer procedures such as the Christman-Snook and Elmslie are used for patients who may fail correction with a Brostrom procedure. Candidates for tendon transfer ankle stabilization would include athletes who will put unusual stress on the ankle. 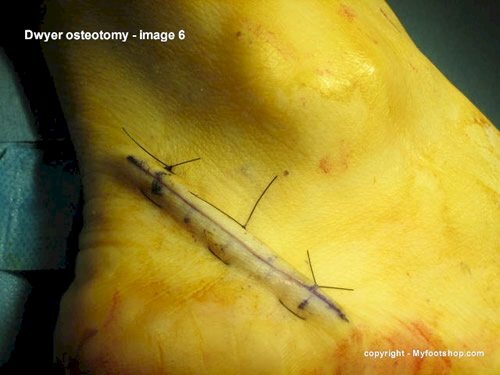 The following images show the steps involved with a Brostrom lateral ankle stabilization surgery. Image 1 shows the approach to the lateral ankle. Image 2 shows the subcutaneous space and extensor retinaculum. Image three shows an attenuated, but intact anterior talo-fibular ligament. 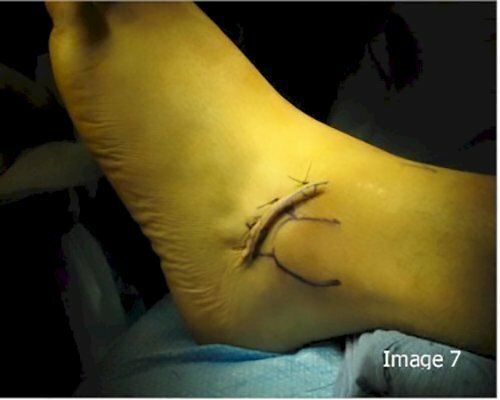 Images 4 and 5 show repair of the ligament with non-absorbable suture (Ethibond) anchored to the fibula (to the right.) 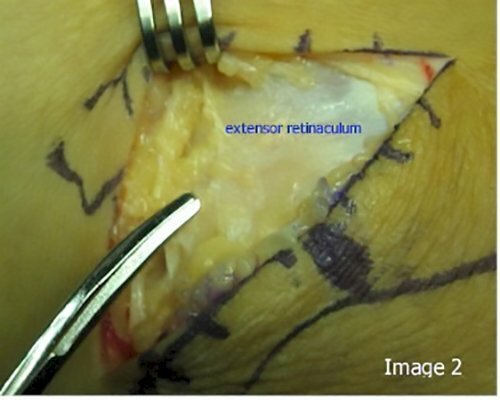 Image 6 shows closure of the extensor retinaculum. Image 7 shows final skin closure prior to casting. Another commonly overlooked aspect of lateral ankle surgery is the position of the heel bone (calcaneus.) If the heel is in an inverted position, this throws the body's center of gravity to the side of the ankle, making one prone to lateral ankle sprains. 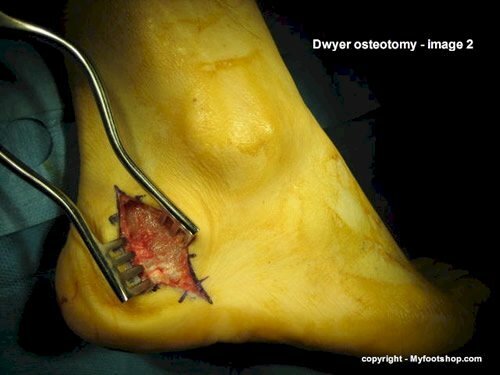 If the calcaneus is in a fixed, inverted position, then part of a lateral ankle stabilization procedure will include a Dwyer wedge osteotomy of the heel to bring the heel into a position back under the leg. A Dwyer procedure helps to prevent against re-injury. 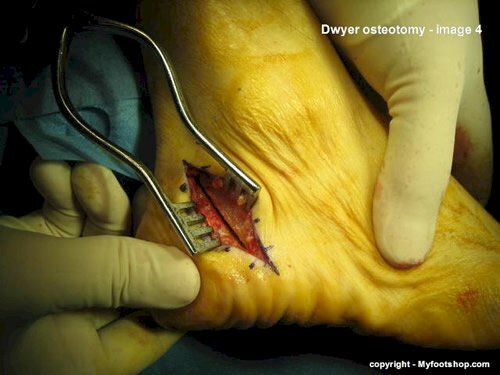 The following images show a Dwyer osteotomy of the heel. Images 2 and 3 show the open wedge created with a saw cut on the lateral aspect of the heel. Image 4 shows closure of the wedge and rotation of the heel into the corrected position. Image 5 shows fixation with two 6.5 millimeter bone screws through the bottom of the heel. Lateral ankle stabilization may also be performed arthroscopically. This technique is referred to as arthroscopic monopolar radiofrequency thermal stabilization. AMRTS employs a radiofrequency probe to shrink the lateral wall or capsule of the ankle joint. The lateral collateral ligaments are also treated with AMRTS. This technique is currently under investigation in shoulder surgery and holds promise as a minimally-invasive alternative to traditional methods of lateral ankle stabilization. Medial ankle sprains are diagnosed and treated in ways very similar to lateral ankle sprains. X-ray is not a reliable tool to diagnose a medial ankle sprain but should be used to rule out an ankle fracture. An MRI can confirm the diagnosis of medial ankle sprain. Treatment of a medial ankle sprain includes rest, ice, compression, and elevation. In severe cases, casting in a non-weight-bearing cast may be necessary. It's infrequent that the medial ankle ligaments need to be surgically repaired. In most severe medial ankle injuries, stress applied to the deltoid ligament will be transferred to the tibia, resulting in a medial ankle fracture. High ankle sprains often are diagnosed with an X-ray and confirmed in three ways. First, widening of the ankle results in a complete rupture of the anterior inferior tibial-fibular ligament. Comparison views between the patient's good ankle and injured ankle can confirm widening of the ankle mortice around the talus. The second diagnostic sign of a high ankle sprain is widening of the lower leg between the tibia and the fibula. Lastly, in severe high ankle sprains, the anterior distal tibial-fibular ligament will avulse, or pull away, a small fragment of bone from the distal margin of the tibia. This fragment is called a Tillaux-Chaput fragment or Tillaux-Chaput fracture. High ankle sprains also can be diagnosed by an MRI. Treatment of high ankle sprains requires surgical re-apposition of the tibia and fibula. This can be accomplished with a trans-syndesmotic screw (between the tibia and fibula) or with an Arthrex TightRope. This procedure is performed in a hospital or surgery center on an out-patient basis. It is performed under general anesthetic and takes approximately 45 minutes to complete. Follow-up consists of six weeks non-weight-bearing in a hard cast. Acute ankle sprains should be evaluated to rule out a fracture of the ankle. Recurrent ankle sprains also should be evaluated by your podiatrist or orthopedist to prevent internal damage of the ankle. 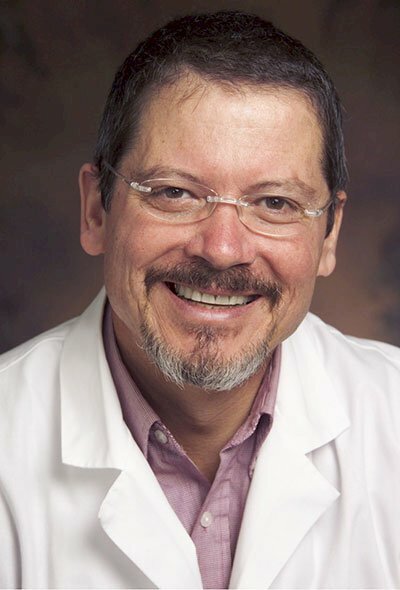 This article was written by Myfootshop.com medical director Jeffrey A. Oster, DPM. Most recent article update - December 8, 2018. Ankle Sprain by Myfootshop.com is licensed under a Creative Commons Attribution-NonCommercial 3.0 Unported License. The Swede-O Ankle Lok Brace offers the highest degree of stiff, lace-up support for weak ankles, chronic ankle instability, sprains, and other injuries. Great for sports and everyday use. Universal right/left. Black only. By Swede-O, Inc. 1/pkg. Lateral Sole Wedge Inserts limit supination, or the tendency of the foot to roll to the outside of the shoe. They're the first over-the-counter solution for supination, foot pain, and excessive shoe wear. Easily fits in all shoes. By Myfootshop.com. 1 pair/pkg. The Malleoloc Ankle Brace offers top-notch, adjustable, rigid support for ankle instability to prevent sprains in weak ankles. Ideal for sports. Fits most shoes. Right/left specific. Blue-gray only. Two sizes. By Bauerfeind. 1/pkg. The Ankle Support - Elastic is a slip-on compression sleeve for stability and pain relief from ankle edema, weak or swollen ankles, sprained ankles, and more. Also a great, lightweight brace for sports. Universal right/left. By Myfootshop.com. 1/pkg. The Ankle Wrap - Figure 8 offers stability and controls swelling following a sprained or broken ankle by providing firm, adjustable velcro compression and support. Universal right/left. By Myfootshop.com. 1/pkg. 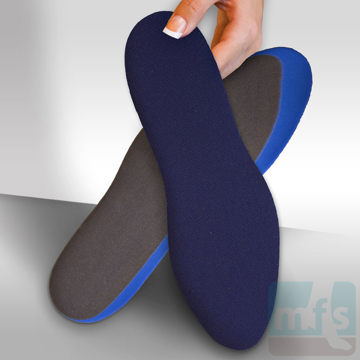 Rubber Heel Wedges straighten the position of the heel to reduce excessive shoe wear, relieve knee pain and correct supination and pronation of the feet. By Myfootshop.com. 1 pair/pkg.